For our first blog post, I thought it would be nice to write about another first, our first time making ice cream! Look what Josh got me for Christmas! It's really a gift for him as well because he knows we'll make delicious treats with it. 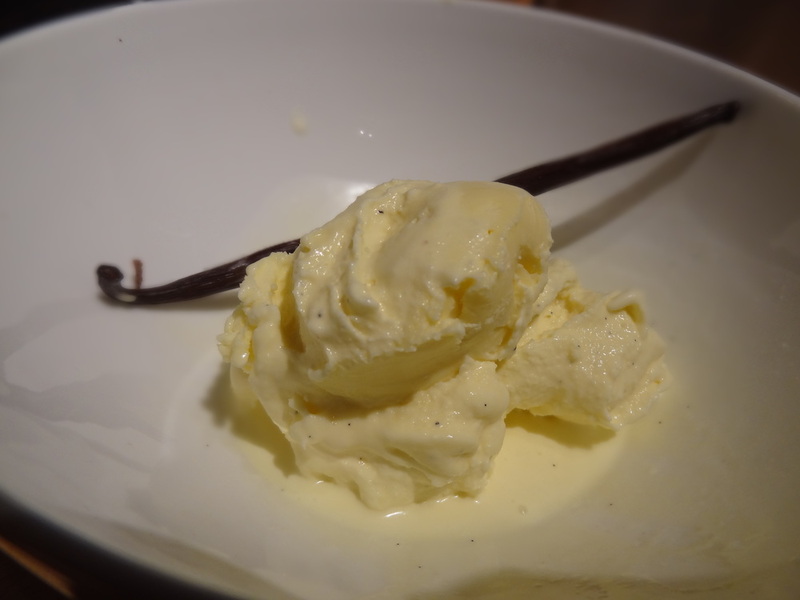 For our first attempt, we chose to make vanilla ice cream. These are the ingredients we used and the recipe book. David Lebovitz's book Perfect Scoop: Ice Creams, Sorbets, Granitas, and Sweet Accompaniments has amazing recipes that I can't wait to try. His book was recommended to me by my close friend Merav who has a fantastic blog that you should check out. I was worried that the unhomogenized milk would somehow separate and mess up the recipe. Luckily it turned out just fine, but I'll make sure to buy homogenized next time. First we warmed up the milk, cream, sugar, and salt. 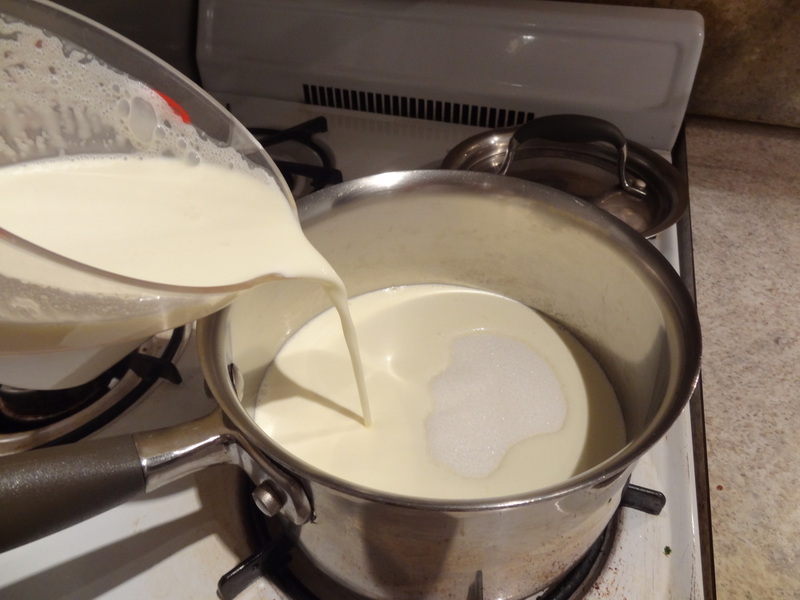 Make sure to do this on a low temperature so you don't scald the milk. 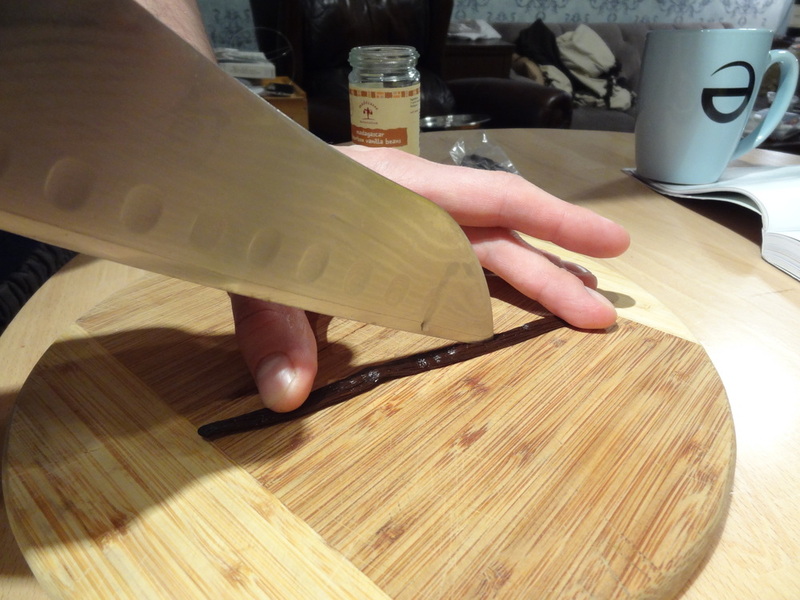 Cut your vanilla bean half-way though from end to end. You want to be able to scrape the seeds out of the bean. We made a double batch so we did this twice. Whisk the scraped seeds into the warm milk and sugar and then also add the pods for extra vanilla-ness. 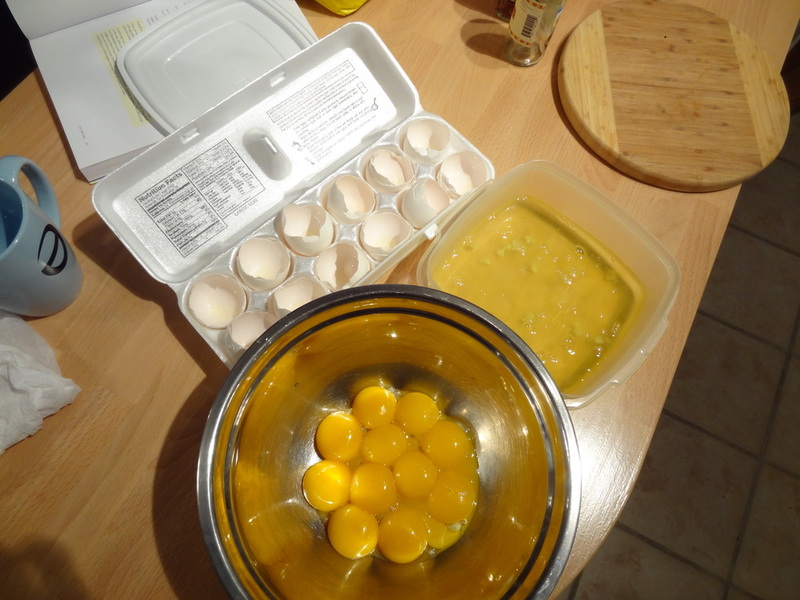 Since we did a double batch, we separated a dozen eggs. We saved the egg whites to make a breakfast scramble the next day. This is a custard based recipe, also known as French-style, rather than Philadelphia-style which has no egg yolks. 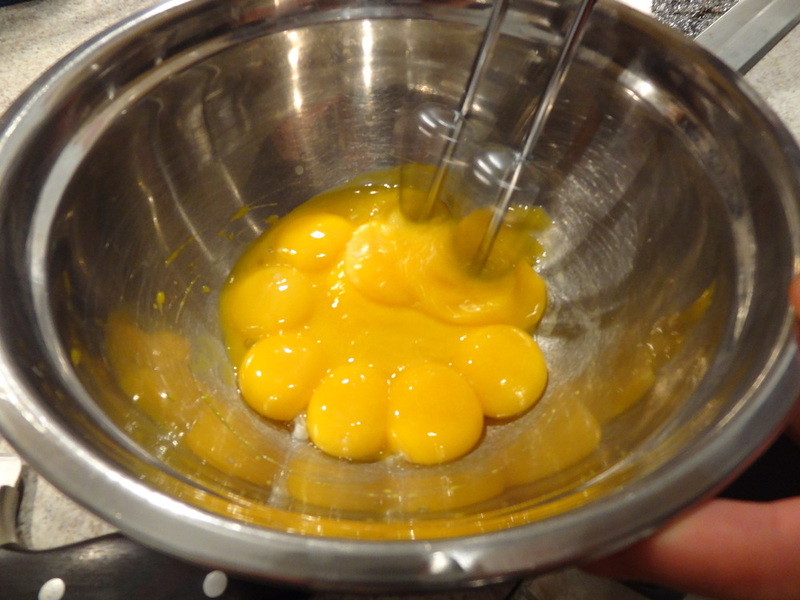 Egg yolks have emulsifying qualities which make a smoother, richer ice cream and they give French Vanilla ice cream that delightful pale yellow color. There are a few other steps to finish the custard base which I neglected to photograph (sorry! 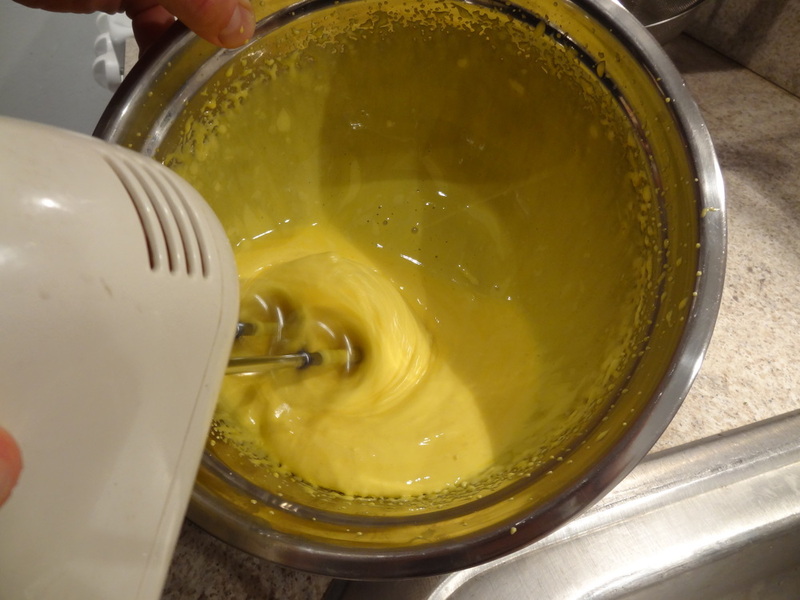 ), but, once your mixture is done, make sure to chill it completely. Luckily, it was a really, really cold evening so we just stuck the covered bowl out on the fire escape for a little over an hour and it was ready. Thanks New York winter! If it's not ridiculously cold where you live, a good rule is to chill it in the refrigerator for at least 8 hours. All that's left is for the ice cream to churn! Just follow your machine's instructions and it's a good idea to pour the mixture into the machine while it's on so it doesn't freeze to the sides of the frozen bowl inside and prevent the arm from churning. We couldn't stop watching it! Although our machine said it is 2 quarts, that doesn't mean it holds a double batch (each batch being 1 quart)!! Don't forget that the mixture will expand as it freezes and as air gets churned in. If you have 2 quarts of mixture and the machine only holds 2 quarts, the ice cream has nowhere to go as it freezes. We had to scrape from the top as it churned to make sure it didn't overflow into a complete mess. On the plus side, we have a lot of ice cream now! Your vanilla pods can be used again for other things! Options that I've seen are to put them into a container of sugar to give it a hint of vanilla. I chose to make a pot of coffee and then poured it into a carafe with a vanilla pod to store in the fridge. I had amazing vanilla flavored iced coffee all week! I would love to provide a recipe with directions, but it's not my recipe to give. The book that I got this from is beautiful and definitely worth buying! Get it here. I hope you liked the first post! Stay tuned for more!